There are two fundamental principles that govern all economic systems: (1) supply and demand; (2) high bid wins. What distinguishes one economic system from another is this: (1) who is allowed to supply, and who is allowed to demand; (2) the currency unit in which the high bid wins. In every realm, there are multiple currencies. There is a scene in Forrest Gump in which Forest's mother pays something extra to the local public school principal in order to get Forrest enrolled in a conventional public school instead of a special school for low-IQ students. She does not pay in dollars. A free market economy is a gigantic system of auctions. There are numerous auctions going on at any time. There are numerous auctioneers. Each of them operates in terms of a question: "Do I hear. . . ?" High bid wins. Other auctions persuade buyers that they really do have a minimum bid. They prove this by having a maximum bid at the same price. Think "bar code scanner." No negotiating is allowed at the check-out counter. Instead of spending time letting potential buyers bid up prices, one against another, the auctioneer decides to make money on volume sales. People do their own shopping and line up at the check-out counter. The more people who pass through, the more money the auctioneer makes, net, at the end of the day. These are all auctions. The same rule applies in all of them: high bid wins. Auctioneers compete against auctioneers. Bargain-hunters compete against bargain-hunters. High bid wins. When an auctioneer shouts "Do I hear. . . ?" he is not competing against buyers. He is encouraging buyers to compete against each other. If there is only one buyer in the room, the auctioneer can shout "Do I hear. . . ?" all day long. He will not hear a higher bid. Imagine that you are at an auction. Some business has gone under. The auctioneer has sent out ads to surviving businesses, announcing the auction of used equipment. On a Saturday morning, the bargain-seeking businessmen – greedy vultures all – assemble to bid against each other for the pickings. The creditors of the bankrupt firm are delighted to see the room filled with greedy vultures. "The more, the merrier," the creditors say. Why? Because the more bidders, the higher the bids will be. Why? Because the high bid wins. Item by item, the high bid wins. There is more money in the auction hall when it is filled with bargain-hunters. The more money that is in the wallets and bank accounts of those in the hall, the more money the auctioneer will generate for the day. The happier the creditors will be. The auction is about to begin. Then, unannounced, several men in uniforms appear in the back of the hall. They are carrying buckets. Who are these guys? They begin approaching attendees. They whisper something in the ears of the attendees, one by one. Several attendees sign a piece of paper. The uniformed men then hand a bucket over to each attendee. Inside each bucket is currency. Legal tender. Moolah. Why is the auctioneer smiling? High bid wins. There will be much higher bids. He will get 10% of whatever the high bidders pay. Some of the people in the auction hall are not smiling. They are the people who did not sign the piece of paper and did not get a bucket of currency. They see what is likely to happen. They will not be the highest bidders today. They may stick around for a while, but they will probably leave early. No bargains here any more. It is possible that the bidders with buckets of money will go home with buckets partially filled with currency. There will be lots of low bidders even among bidders with buckets of currency. Not everyone will be able to afford the bargains. Why not spend all of the money? Because there is always another auction going on today. There will be more tomorrow. Also, there were those forms that they all signed. It turns out that the buckets of currency were not free. The signers promised to repay the supplier of the currency. They have to pay more in return than they received. If they return any of the remaining currency, they will owe less. Someone is going to keep that currency: (1) the auctioneer (briefly), (2) the auctioneer's bank, (3) the banks of the creditors, who will be paid their 90% share of whatever the auctioneer was paid, (4) the bidders who did not bid high enough to take home bargains instead of currency, (5) the auctioneers at the next auction that the bargain-hunters move to. At the end of the day, someone will own the currency, and someone else will own the bargains. Once the currency is printed and lent into circulation, it will stay in circulation until (1) it wears out, at which time, it will be exchanged for replacement currency; or (2) it is returned to the bank, thereby canceling the debt. The bank removes it from circulation. It must then (1) keep it in its vault as a legal reserve, or (2) lend it out again, or (3) return it to the Federal Reserve in exchange for a digital reserve, letting the FED destroy the paper, or (4) pay off its debt to depositors, return the currency to the FED, and let the FED destroy the paper. Most of the currency winds up in banks. It flows out. It flows back in. There are exceptions to this rule. There are certain auctions in which no one wears uniforms, the auctioneer and his assistants are armed, the bidders and their assistants are armed, and no one ever seems to go bankrupt. They just disappear. They sleep with the fishes. The currency remains in circulation. "Digits to currency to digits" becomes "digits to currency." This is why, in a fractional reserve banking system, black markets are inherently deflationary. There is another factor: currency sent home by aliens. The dollars function as black market currencies back home. Back home, prices in the home currency rises, but prices in dollars stay the same. The goods are siphoned out of the legal market into the black market. Again, black markets are inherently deflationary for the country with the broadest demand for its currency. Some auctioneers will prosper. Others will not. Some auctioneers will retire. Some will go into another line of work. A few highly successful auctioneers will offer shares of stock in their businesses, and the investing public will bid against each other to buy ownership of dreams of future net returns at many future auctions. "Quit looking at the share price of auction companies. Quit looking at the share price of the companies that attend auctions. Instead, look at the prices of the final goods sold at the auctions. If you want to guess what prices will be higher or lower at next month's auction, look at the change in the money supply." In short, ignore the auctioneer and the bargain-hunters. Count the money in the buckets. Commercial bankers usually want to lend money. Ever since 1934, with the creation of the Federal Deposit Insurance Corporation, American bankers have always wanted to lend as much money as they were legally allowed to lend. This has changed since late 2008. We are in uncharted waters. Commercial bankers are limited in how much money they are legally allowed to lend. There are two major restraints: (1) reserve requirements set by the Federal Reserve System; (2) the listed dollar value of the assets in the portfolio of the Federal Reserve System. When the FED lowers the legal reserve ratio, banks lend more money. When the FED increases its purchases of assets, banks lend more money. They make money by lending. The problem today is this: they lose money by lending foolishly. They fear not getting re-paid. So, they remain content with 0% to 0.25% from the FED, which the FED pays on excess reserves, meaning reserves above the legally required minimum. The FED does not spend this money into circulation. Excess reserves therefore call a halt to the money multiplier effect of fractional reserve banking. The FED loses money on the deal, but not much. The banks make money on the deal, but not much. The economic recovery therefore gets short-changed. Banks do not lend the money that is held as excess reserves. Their commercial and industrial loans at the end of 2009 – "the recovery" – were about 18% less than the same loans a year earlier in 2008, which was the worst recession year since 1937. View the chart here. The increase in the Federal Reserve's balance sheet since September 2008, meaning the monetary base, has been offset by the increase in excess reserves held by commercial banks. This is why we are not experiencing hyperinflation. Prices have risen, but not by much – under 2%, November 2008 to November 2009. View the charts here. If ever there was a time when America should have experienced price deflation, it was 2008–2009. It did not happen. If ever there was a time when America should have had hyperinflation, it was 2008–2009. It did not happen. Commercial banks will not start lending until the recovery is clear. The recovery is a myth. So, banks will not start lending, no matter what the FED does. The largest banks remain over-leveraged. They will not be able to find borrowers at any rate of interest, so the capital markets will collapse (except gold), and then consumer prices will fall. To the deflationists, I answer: the largest banks are making money hand over fist. It is the local banks that are failing. The FED has done what it was set up to do in 1913: protect the largest banks. Commercial banks will start lending when the recovery is clear. The FED will probably not contract the monetary base all the way back to August 2008, because this would bring on another crisis comparable to September 2008. The FED will not risk bankrupting the still highly leveraged megabanks. It will therefore not fully offset the decrease in excess reserves. It will not "wind down" all the way, if at all. Bernanke fears 1930–33 more than anything else. So, the money supply will rise. Prices will follow. I don't know what the deflationists will say in response. When they do, I will respond. The increase in excess reserves has been voluntary. The bankers are afraid to lend, even to the U.S. Treasury. This is a restraint on trade. It is a restraint on the creation of money. It is a restraint on economic growth. It is entirely rational. The non-megabank bankers are afraid that they will face losses. There will be no government bailouts for them. They prefer to make whatever money they can through existing loans, which they are familiar with, rather than investing in new ventures. They are forfeiting the income that could be generated by a trillion dollars of loans. They are scared. Not running scared. Sitting scared. Catatonic scared. Bernanke publicly says that the bankers' refusal to lend bothers him. In a November 16, 2009 speech, he announced the following. However, access to credit remains strained for borrowers who are particularly dependent on banks, such as households and small businesses. Bank lending has contracted sharply this year, and the Federal Reserve's Senior Loan Officer Opinion Survey on Bank Lending Practices shows that banks continue to tighten the terms on which they extend credit for most kinds of loans – although recently the pace of tightening has slowed somewhat. Partly as a result of these pressures, household debt has declined in recent quarters for the first time since 1951. For their part, many small businesses have seen their bank credit lines reduced or eliminated, or they have been able to obtain credit only on significantly more restrictive terms. The fraction of small businesses reporting difficulty in obtaining credit is near a record high, and many of these businesses expect credit conditions to tighten further. This is an accurate summary of conditions last year and conditions so far this year. He knows exactly what the problem is: ". . . with loan losses still high and difficult to predict in the current environment, and with further uncertainty attending how regulatory capital standards may change, banks are being especially conservative in taking on more risk." He gave the impression that the FED was doing everything it can to get small banks lending. The Federal Reserve has used its authority as a bank supervisor to help facilitate the flow of credit through the banking system. In November 2008, with the other banking agencies, we issued guidance to banks and bank examiners that emphasized the importance of continuing to meet the needs of creditworthy borrowers, while maintaining appropriate prudence in lending decisions. This sounded positive. But the reality was different. The FED was focusing on the megabanks, not the bank around your corner. This past spring, the Federal Reserve led the Supervisory Capital Assessment Program, or SCAP – a coordinated, comprehensive examination designed to ensure that 19 of the country's largest banking organizations would remain well capitalized and able to lend to creditworthy borrowers even if economic conditions turned out to be worse than expected. At any time, the FED can get all banks lending. All it has to do is impose a fee on all excess reserves. It can test each fee. It can keep raising this fee until the banks have withdrawn most or all of their excess reserves. To do this, they must lend the money. For every dollar of decrease in excess reserves, the bank must buy an asset to offset the bank's legal liabilities to its depositors. It must offset these liabilities with equal-valued (book value) assets: loans. The FED is in complete control over excess reserves. It pays banks a pittance to maintain these reserves. It is legally authorized to impose fees. Alternatively, it could decide, on its own authority, to lend out all of the money kept in excess reserves. It could buy T-bills. The government would like that. The money would flow back into the economy. It would be spent. The money multiplier would rebound and go positive. The offsetting excess reserves would no longer offset the increase in Federal Reserve credit. The M1 money supply would double. Within a year, prices would be heading for a triple-digit increase. All of this is legally possible for the FED to do. It refuses to do it. Why? Because it likes the present policy. It does not have to wind down – sell off assets. It also does not have to face rising long-term interest rates that would result from a doubling of the money supply. It does not have to worry about a collapse of the housing market as a result of 25% or 40% mortgage rates. Also, the corporate bond market has not collapsed. What has it cost the FED to allow excess reserves to rise by a trillion dollars? Only the interest on 0% to 0.25% interest payments to the banks. That's a low price. In every market, the high bid wins. In a high division of labor free market, high money bid usually wins. Monitoring the changes in the supply of money is the key to accurate predictions of consumer prices a year down the road. 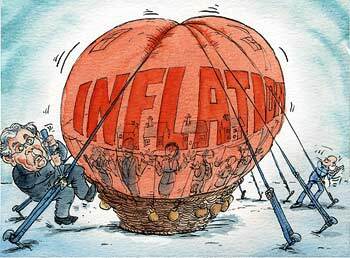 The deflationists believe that it is possible to have significant price deflation in the consumer price index, despite an increasing monetary base. They believe that a fall in the market price of one or more capital markets can and eventually must lead to a fall in consumer prices. Commercial banks will refuse to lend, no matter what. Then capital markets will collapse, due to the burden of debt. They will not be able to repay. The Federal Reserve has pursued the first two. It has not pursued the third. When it does, or when commercial banks voluntarily reduce their excess reserves to zero, there will be monetary inflation to match the expansion of the monetary base in September and October of 2008. Then the FED will have to decide how to "unwind" what it did in 2008. The political odds are in favor of the FED's refusal to unwind by 100%. This is not inevitable. Hence, neither price inflation nor price deflation is inevitable. But, if past results are a reliable indicator, there will be inflation.